The next salon will take place on Tuesday 8th March 2011, from 6:30 pm at Franko B's studio - studio 7, P 1 studios block C15,Taylor Place, Payne road, London, E3 2SP. All welcome. you can bring some food and drink. If you would like to come, please email frankob2000@yahoo.co.uk, or you can just turn up on the day. Tim Etchells presents Franko B: "Action 398"
Transmediale festival, Berlin - February 2011. 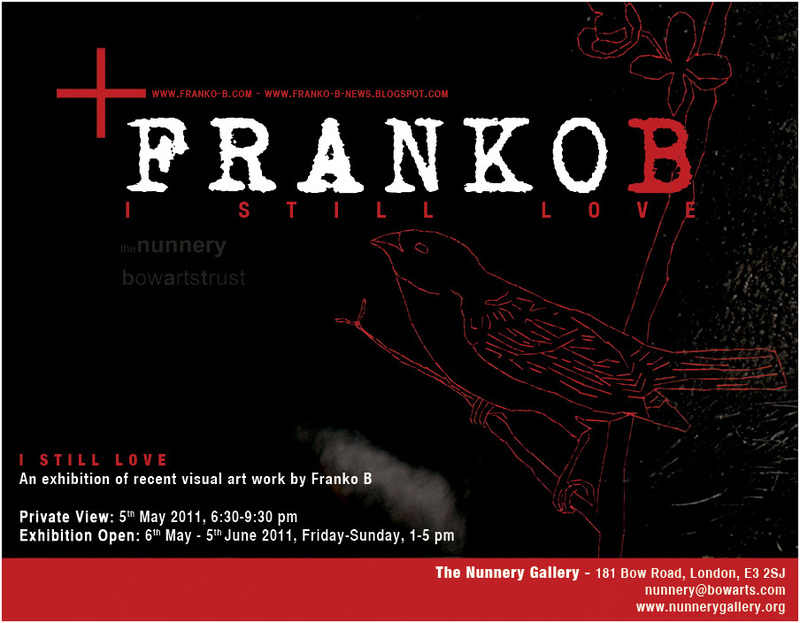 E-flyer for I STILL LOVE - an exhibition of recent visual art work by Franko B, at the Nunnery Gallery, London. Private View: 5th May, 6:30-9:30 pm - put it in your diary! 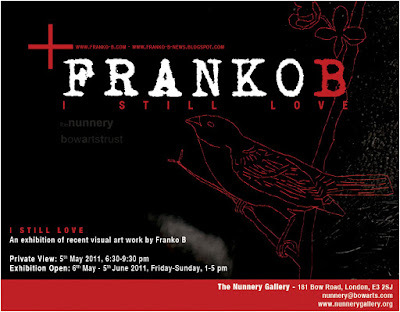 I Still Love follows on from the artist’s recent solo exhibition at PAC (Pavilion of Contemporary Art) in Milan, and is Franko B’s first solo exhibition in London for seven years. 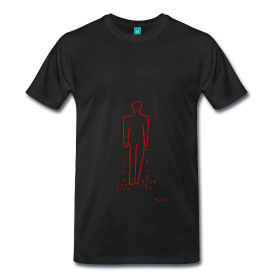 A bold, eclectic artist, for many years a leading figure on the international performance art scene, Franko B continues to express the beauty of existence in his work, focusing on powerful and emotive imagery. This exhibition will include a new series of embroidered canvases, never before shown in the UK. The canvases, which depict animals, flowers, portraits, male bodies, as well as images of torture and war, play on the central themes of Franko B’s work – death, eroticism, intimacy, pain and compassion – here brought into a new light through the exclusive use of red cotton. The fragile beauty of these images, delineated on the blank canvases with bright red thread, is reminiscent of the red blood marks on the whitened body of the artist – which were typical elements of his earlier performance works, and are deeply embedded in the public perception of his practice. Franko B was born in Milan in 1960 and has lived in London since 1979. He graduated from Chelsea College of Art and Design and has been producing work across a diverse range of media since the early 1990s – ranging from video to photography, from performance to painting and sculpture. He is a visiting lecturer at many arts institutions and universities across the world, and has run several workshops and mentoring schemes for emerging artists. Since 2009, he has been Professor of Sculpture at the Academy of Fine Arts in Macerata, Italy. Franko B has performed at Tate Modern, ICA (London), South London Gallery, Arnolfini (Bristol), Palais des Beaux Artes (Brussels), Beaconsfiled (London), Bluecoat Centre (Liverpool), in Mexico City, Berlin, Copenhagen, Madrid and Vienna, to name but a few. He has presented his visual art work at Tate Liverpool, RuArts Foundation (Moscow), Victoria and Albert Museum (London), Freud Museum (London), PAC (Milan), Contemporary Art Centre (Copenhagen) and many more. His works are in the collections of the Tate, Victoria and Albert Museum, South London Gallery and the Modern Art Museum of Tel Aviv.